You can also earn cash on Points2shop. 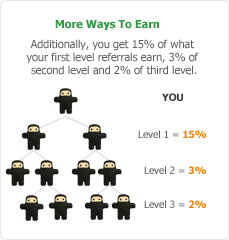 You can earn money from referrals, contests, etc. and get paid through PayPal, Cheque, Visa card and Amazon Gift Card. If you want to earn only cash; follow these steps. Points2shop offers all the earning opportunities of a GPT site, including offers, surveys, etc. P2S also provides various Contests, Sweepstakes & more. Below I’ve listed all the ways to earn points and cash available on Points2shop. Points2shop has merged offers and videos under one section. Offers and videos are provided by some advertisers. Some of them are; OfferToro and TrialPay. Many advertisers (Peanut Labs, SuperRewards, SuperSonicAds, etc.) also offers surveys. In a nutshell, in this section, you’ll get points/cash to complete offers, watch videos, play games, download mobile apps, and take surveys. Like PrizeRebel, P2S has a lot of offers for you to earn points/cash with. And of course, it also has many paid and trial offers. I always prefer offers over surveys, because they are easier to complete and quick. Unlike surveys where you just keep filling qualifying surveys and still not qualify for one. Free offers are a great way to earn easy points on Points2shop. I’ve mentioned in my earlier reviews that, you should be careful while you opt for a paid or trial offer. Read the instructions attentively. Read the instructions at least 2-3 times. Read it until you are sure what you need to do to receive your points. And remember to cancel the trials before they expire. When I was reading points2shop reviews, most of them had one thing in common- they all were saying that it is very tough to qualify for points2shop surveys. So, to write an honest review, I checked it myself. I tried filling 15-20 surveys but only qualified for 3 of them. So, yeah! It is super hard to qualify for surveys on points2shop. I am not discouraging you. This is what happened to me. You might have a better chance of qualifying (based on your profile and location). And if you do qualify for one, you can quickly earn 100-250 points. If you want to earn money filling out surveys, then I recommend you to join the sites with high paying surveys, like Swagbucks, IPoll and InboxDollars. Swagbucks and InboxDollars are my favourites, because, their surveys are targeted, and you have a better chance of qualifying. While Swagbucks & InboxDollars are GPT sites, IPoll is a survey site. So, of course, their survey are targeted. On IPoll you can easily earn $5-$10 per survey. I just completed two surveys, and I was able to earn $9.87. The points2shop app doesn’t have app download offers, where you get points for downloading apps from Playstore through the app. Sometimes you need to register or keep the app installed for the specified time or both. When you log in (on Points2Shop app), you’ll instantly earn 10 points. And 1 point for every day you open the app. The points2shop app is an excellent way to earn some points on the go easily. You can earn points for taking surveys, completing offers, watching videos. In this section, you’ll find earning opportunities that can be completed daily (every 24 hours). You can earn points from them after every 24 hours. Where you can earn decent points by completing surveys, Recurring Tasks are just a waste of time. In case you’re wondering what Recurring Tasks are: Recurring Tasks are micro-jobs (small jobs that require you to visit a website, like a Facebook page, profile, etc.) Earnings from these tasks are extremely low. You’ll barely make $0.01 for a task. So, it’s better to avoid them. You’ll get cash back when you shop on sites through Points2Shop. Cashback is another great way to earn cash on Points2Shop. Because you will earn cash for something, you were going to buy anyway. Paid Games are a fun way to earn points. You can earn up to 150 points per game! But Paid games are only available for Bronze or above level members. You can also play these for free. So, brush up your skills before you play paid games. Because, you don’t want to lose the points that you worked so hard to earn, right? Points2Shop matches you with a person of same skill level as yours. So, that the competition equally fair. Contests are an awesome way to earn extra cash. Points2Shop holds many weekly and monthly contests. Their prizes reach up to $15. Points2Shop holds two types of contests: Team Contest and Individual Contests. P2S “Team Contest” was a surprise to me. As I’ve never seen any GPT site holding any kind of team contest. It was completely new to me. So, of course, I was curious. I did some research and found the following info regarding P2S Team Contest. Team contest can be monthly or weekly. For the monthly contest, merits that are added from 6th to 6th are counted. And for the weekly contest, merits from Thursday to Thursday are counted. So, What is a Team Contest? In team contest, you participate by either creating your own team (recommended) or by joining one. The team members work together (donate “merits”) to win the contest. The team with the highest number of “Merits” wins the first prize. Every month there is a total of $66 in prizes. Prizes are given to the top 10 teams with the most merits. The prizes are distributed among the members of the team, but the leaders of the teams get a bit more than normal members. For completing Achievements. The number of merits you’ll get for completing an achievement is displayed next to it with a star icon. 10 merits for being active on the Ponts2Shop site. 50 merits for completing SOOP surveys. 50 merits for visiting the coupon page. Win up to 50 merits in Spin2Win. How to and Why Create your own Team? The worst part of being a member is; the team leader (the one who created the team or who has administrative powers) can kick you out of the team whenever they want. By creating your own team, you become the leader of the team.Naturally, you have all the administrative powers. You can also appoint another leader to your team. The maximum leaders a team can have are 2. Another perk of being a team leader is that the team leaders earn slightly more (from team contest) than the ordinary members of the team. Now, let’s create your TEAM. 1. From "COMPETE" menu click "Team Competition" under "Contests". You can accept the request to join your team "Your Team" tab. If you need any kind of help, Just click on “Help” tab next to “Your Team”. Now promote your team in Points2Shop forum, shoutbox, etc. The maximum numbers of members a team can have is 5. Points2Shop recommends creating your team, once you have 20,000 or more merits in your account. So, you have the upper hand in the next contest. Don’t have the time to go through with the hassle of creating, promoting and managing your team? Or you have your own reasons? From "COMPETE" menu click "Team Competition" below Contests. Now join the team of your choice! You can see the number of merits earned by that team on the right side. This page only shows the Lifetime earnings of the teams, not current merits or their position in the current Contest. Individual contests are simple and easier as compared to team contests. Because you don’t have to manage a team or, worry about being kicked out. You alone are responsible for winning or losing, unlike team contest where all team members need to work together. Referral Contest: Referral Contest is a monthly contest. It concludes on the 26th of every month. And the prizes range from $15-$1. The user who refers most in that wins the highest prize which is $15. Prizes are credited to the winners account in 2 weeks. Referral Contest for New Members: This contest is the same as the referral contest except this time only users who register during the month in which the contest is running, will rank in the contest leaderboard. Prize amount ranges from $15-$1. High-Value Contest: In High-Value contest top 15 Points2Shop earners win prizes ranging from $15 to $1. It is a monthly contest and concludes and starts on the 16th. The prize amount is credited to the winner's account within 2 weeks. There are two High-Value Contests, one for the UK and the other for US members. Completion Contest: This contest runs twice each month. Members can enter into the contest by completing Points2Shop offers. External offers (offers from TrialPay, OfferToro, etc.) do not count. There are three contests that run simultaneously; they are contests for US, UK, and other members from foreign countries. There are ten winners each month, and prizes range from $10 to $0.05. Daily Survey Completion Contest: The Daily Survey Completion Contest is similar to the Completion Contest except in this contest only Daily Surveys are counted. There are two contests that run each week, One for US members and the other for UK members. There are total 9 winners with prizes ranging from $0.05 to $5. P2S Sweepstakes prizes worth up to $25. These prizes include gift cards from Gamespot, Office Depot, Target and Best Buy. Similar to InboxDollars, Sweepstakes entries do not cost you any points or cash. No purchase is required to get entries or claim the prize. Great huh? How to Get Sweepstakes Entries? You can get sweepstakes entries by landing on sweepstake entry on Spin2Win. Once you win sweepstakes entry, you must claim the entry. If you don’t, the entry, the entry will be lost. You can’t carry that entry forward to use in other months Sweepstakes. So, make sure you claim your sweepstakes entry. The winner is selected within 2 days after the end of the Sweepstakes. You will be contacted via personal email. You must claim the prize within one week. If the prize is not claimed within the given time, then again a new winner will be selected. After claiming your prize, the gift card will be delivered to you via e-mail or physical mail. The weekly lottery is a great way win points and lottery tickets! You can win lottery tickets in Spin2Win. All tickets that you have earned will be used in the next lottery. A new lottery is held every week. The jackpot will grow by 1000 points (that's $10) every week until it is won! Your reward is determined by the numbers you have matched (starting at the right). If you have the ticket A91765 and the winner is A98765, you matched 3 numbers. If you match all 6 numbers, you win the jackpot. If you only match the last 5, you will win the second prize - and so on. This is a chance game, where you can win prizes like; merits, lottery tickets and sweepstakes entries. As a new member, you’ll get 10 free spins as a gift. The nicest thing about Points2Shop’s Spin2Win is that it doesn’t cost you anything for spins! It’s totally free! You just need to earn tokens. You can earn tokens by earning at least 50 points/cents a day. You’ll start with 1 token a day. The number of tokens you earn will increase each consecutive day you earn 50 cents/points. On 1st day 1 token, 2nd day 2 tokens 3rd day 3 tokens........7th day 7 tokens. You’ll keep earning 7 tokens a day until you keep this streak. Earnings from referrals are in cash. Honour level is the level of a member. You start out as a NEW level member. As you level up, new features will be unlocked for you. To reach higher levels, you need to complete certain tasks. The next level is Bronze which you can achieve by verifying your address. Reliable manual offers are available. In the shoutbox to vote for people who give good advice. Challenge people to compete with you in a one-on-one game. Tag offers to classify and label them. Advice rating is disabled after Silver, concentrate on giving advice. 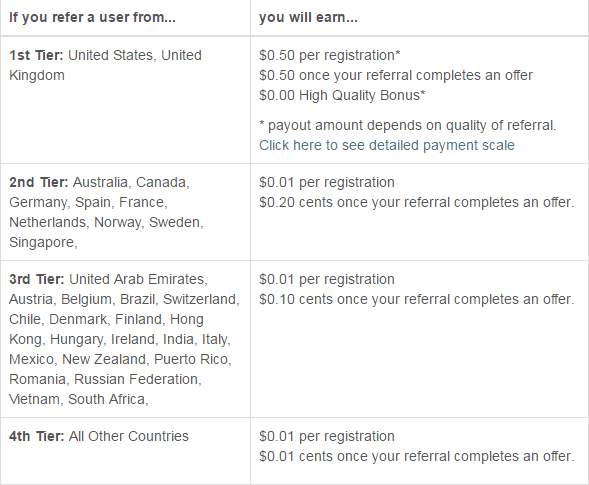 Cash: The minimum cash payout starts from 1$ through PayPal. Other payment methods are; $5 Check, $5 Visa Card and Amazon Gift Card. Mentioned amounts are minimum cash you need for withdrawal through particular payment methods. Points: You can redeem your points for any product on Amazon. 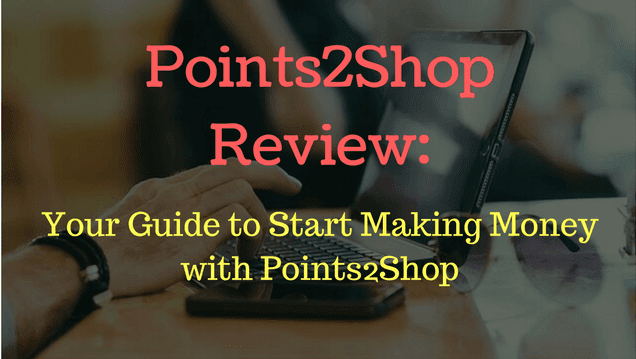 Points2Shop is a legit GPT site which has been online since 2007. Now it has more than 13 million members worldwide. If you have the time, you can make $50-$300 per month, if you are from US or UK. Indian citizens can make $5 to $25 a month from Points2Shop. Contests are the greatest feature of P2S. And not to mention app, where you can earn 1 point for just opening the app. Go to Points2Shop & sign up Now to get your free 250 points instantly. And after that download the P2S app and get more 11 points. Great review, Himanshu. I really love to earn points and spend them for my favourite products. 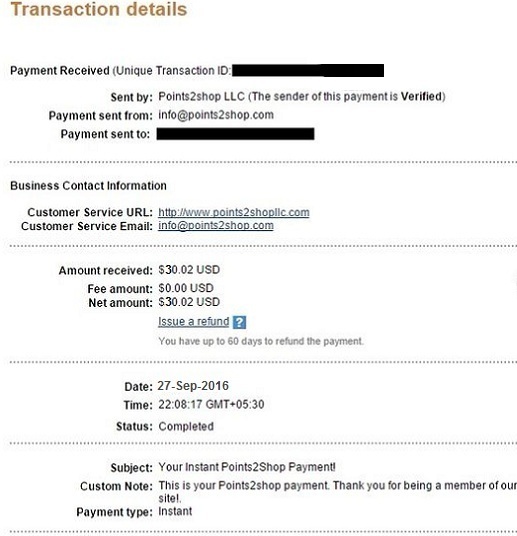 Poins2Shop is seriously a great way earn cash and points.